At Spectrum, we are the oldest large scall Biogas Commercial operation in the country with a 100 TPD of Pressmud capacity producing Biogas since November, 2012. We are also the first company to have received permission to fill our Biogas for vehicle application. The raw gas produced by anearobic digestion or fermentation of organic matter is called Bio Gas. The cleaned bio gas which constituets of over 92% methane (CH4) is referred to as Bio CNG or CBG. Manure withiout adding any chemical, which boosts the health of the plant and also prevents deterioration of the soil is called Organic Manure. It is our policy of using cleaning methods and products which environmentally friendly and provide cleaner disposal alternatives. 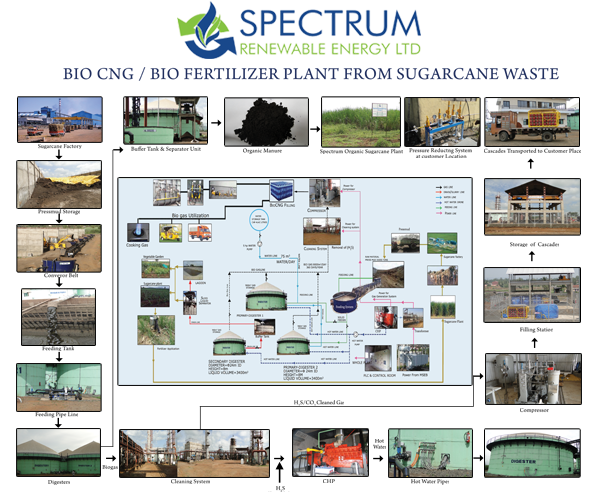 Spectrum Renewable Energy offers organic waste producers a comprehensive spectrum of services including project management, plant design, construction, as well as maintenance and technological support. We are a global biogas company dedicated to providing innovative renewable energy solutions for the organic waste management and agriculture sectors. We offer organic waste producers a comprehensive spectrum of services including project management, plant design, construction, as well as maintenance and technological support. We work to profitably generate renewable energy, better our environment, reduce waste management costs, and create new forms of revenue. We provides a start to finish solution that converts organic waste into Bio-CNG and organic manure/soil conditioner that results in increased industrial and farmer productivity and a cleaner environment. In partnership with one of Maharashtra’s largest sugarcane cooperatives, Warana Sugarcane Cooperative, SREL has developed a first-of-a-kind project that converts a sugarcane waste called pressmud (filtercake) into renewable CBG and organic manure/soil conditioner. The CBG is a clean and inexpensive fuel that is being sold to industrial customers, and the nutrient-rich organic manure/soil conditioner is being sold to the cooperatives’ sugarcane farmers and in the local agricultural markets. Spectrum Renewable Energy Limited (SREL) is dedicated to the development of innovative biogas projects in rural markets that capture renewable energy from organic waste products, while increasing agricultural profitability and sustainability through environmentally responsible practices.